The "strongest bid possible" for funding to back a £7.3m overhaul of a bridge linking Scotland and England will be submitted by the end of May. If successful it would allow work on the Union Chain Bridge to start early next year. A first round bid to the National Lottery Heritage Fund secured a £360,000 development grant. It is now hoped a second stage submission will also be successful in order to allow the project to proceed. 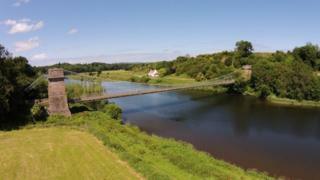 The Union Chain Bridge crosses the River Tweed from Fishwick in Berwickshire to Horncliffe in Northumberland. It was completed in 1820 and is believed to be the oldest operational suspension bridge in the world still carrying vehicles. Both Northumberland County Council (NCC) and Scottish Borders Council (SBC) have already committed £1m each to its overhaul. Glen Sanderson, NCC's cabinet member for environment and local services, said the bidding process was "extremely competitive". However, he said they had been "working tirelessly" on the bid. "We are confident that by May we will have developed the strongest bid possible for submission to the next round, so we can secure the funds needed to deliver this ambitious and exciting project," he said. Gordon Edgar, SBC's executive member for roads and infrastructure, said a "massive amount of work" had already gone into the bid. He said that although it would not go in until May that should not stop work going ahead in February next year. Robbie Hunter, who chairs the Friends of Union Chain Bridge, said: "We are grateful for all of the hard work that has been undertaken by the project team and we all remain committed to securing the long-term future of this amazing bridge. "It is fitting that the bid for round two funding will now be submitted just before the 200th anniversary of the laying of the original foundation stone for the bridge's construction - with the bid marking the foundation for the proposed comprehensive conservation works that will safeguard the bridge as a vehicle crossing for at least a further 120 years."